The Lackawanna Historical Society is headquartered at the Catlin House in Scranton’s Hill Section. 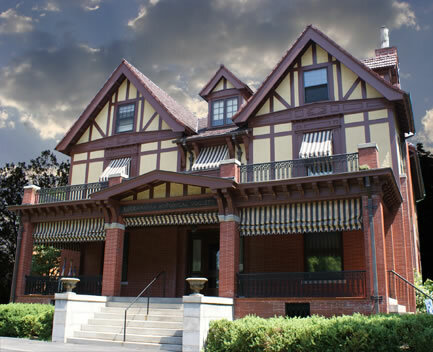 The former residence of George H. Catlin, an early financier in the city, and his wife, Helen, the home is one of Scranton’s architectural treasures. Designed by architect Edward Langley and built in 1912, the Tudor Revival style home is a stately example of the upper-class homes of its time. The three-story, sixteen-room residence features walnut woodwork, molded plaster ceilings, brass lighting fixtures, a three-paneled stained glass window, and six fireplaces. Most of the furnishings are original to the Catlin and Archbald estates and the décor is reminiscent of the late 19th and early 20th centuries. The house was bequeathed to the Lackawanna Historical Society by Mr. Catlin, a lifetime member, who died in 1935. The LHS received the property in trust upon Mrs. Catlin’s death in 1942. At present, the structure serves as a museum and accommodates office space, a research library, exhibit rooms, storage rooms, and a lecture area.